I have the next year mapped out (one line for each day) and have the week subtotal at the end of each week (which is a Friday). Really have no idea how to do this one. Delete all of Column C including your header. The column must be entirely clear because an array formula will "take over" that column in the next step. This "wrapper" tells Google Sheets to treat the formula differently that regular formulas. Where regular formulas return one result, an array formula processes an entire range (in your case, all of Column C). It's important to keep in mind with array formulas that all ranges being considered in computations within the formula must be the same size. As the array considers all of the column, if it assesses that the current row is Row 1, it should leave the header "Weekly Total." I could have used any column letters as the ROW() parameter and it would have worked the same; I just tend to use the first column whose data will be considered in the formula, which in this case is Column A. If it is not the first row, check to see if the corresponding cell in Column A is blank. If it is, also make the corresponding cell in Column C blank. 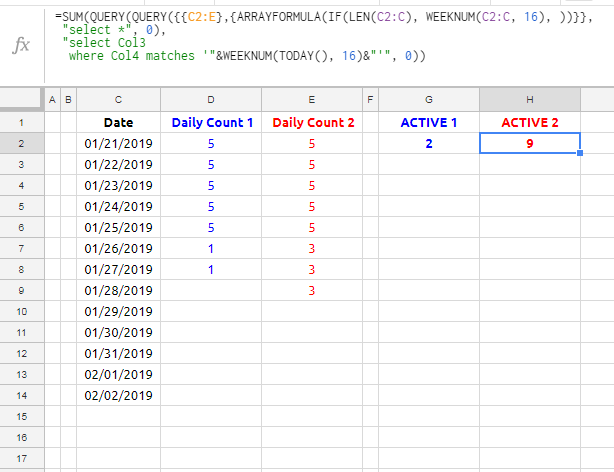 If it is neither the first row nor a row where Column A is blank, we know the corresponding cell in A contains one of your dates. If the WEEKDAY of any date does not equal 6 (counting Sunday as 1, Friday is 6), also leave it blank. If it is not the first row, or a row where A is blank or a non-Friday day, we're on a Friday. Now check to see if the date in Column A is more than six days away from today (i.e., past next Friday). If so, keep those future-date cells blank as well. If the cell in Column C is not in Row 1, not across from a blank cell in A, and not across from a non-Friday day, we need to do a calculation. The first part of the calculation will be to take the entire sum of numbers from Column B. From this, we're going to subtract (or "rule out") certain amounts. SUMIF usually takes a standard range. But we can also ask it to consider row numbers as a special range, which is what's happening here. In English, this part says, "Check all row numbers and flag only those that are less than or equal to seven rows before the current row." By wrapping the condition in IFERROR, we can tell the formula, "If you run into any problems, just use this value instead." This IFERROR control exists solely for that first week in January, in which case we don't let the formula try to go any further back than Row 1 (that's the 1 after the comma). Together, this says, "Make a group of all values in Column B that occur more than seven rows (i.e., days) ago (or, in the case of the first week of January, just don't throw me an error)." 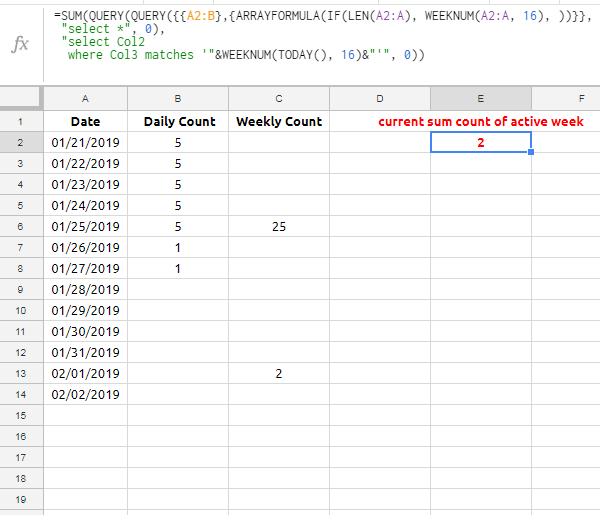 If the array formula is not on the first row, not across from a blank A cell, and not across from some other day but Friday, start by summing all the numbers in Column B and then subtract any numbers earlier than seven rows (i.e, days) back. This leaves us with a total of only values in Column B from any Friday forward. But we still have to trim off some values. Finally, trim off the sum of all numbers in Column B that fall in ROWs greater than (past) the current row (i.e., "after today"). This leaves us with only Fridays showing the sum of values from only the last seven days of Column B. Not the answer you're looking for? Browse other questions tagged google-sheets-query google-sheets-arrayformula google-sheets-dates or ask your own question. How to filter, SUM and display multiple values with multiple conditions added daily?